The majority of Afro-Iranians came to Iran via the Indian Ocean slave trade, a trade route between East Africa and the Middle East, which was dominated by Afro-Arabs merchants beginning in the ninth century. Because of the dispersal of slaves throughout the Middle East and subcontinent, virtually every country bordering the Persian Gulf has a legacy of slavery and African population, like the Afro-Iraqis, Afro-Pakistanis, Afro-Kuwaitis, Afro-Omanis, Afro-Saudis and so on. It is important to note, however, that not all slaves in Iran were African, and not all Africans came to Iran by way of slavery. Iran also had alarge number of slaves from Southern Russia and the Caucuses in the north, while some African sailors came for work in the Persian Gulf. Despite this, the “black slave” image is dominant in Iran. By the nineteenth century, African slaves were prized as domestics or concubines in wealthy households. Slavery persisted as a legal practice in Iran until 1929, when parliament introduced a bill that granted slaves freedom and declared them equal to all other Iranians. Although African slaves were dispersed across Iran, many Afro-Iranians settled in southern regions bordering the Persian Gulf after their emancipation. Since then, census records have not adequately reported the numbers of Afro-Iranians, and statistical information on these communities is largely unavailable. 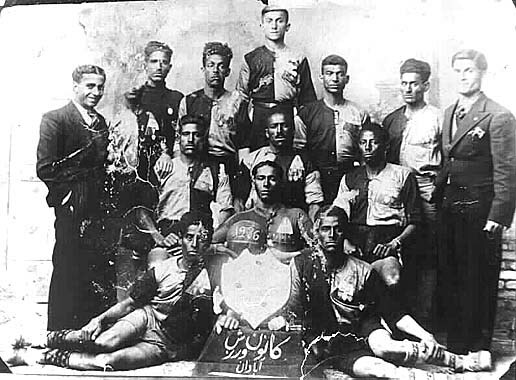 Soccer team in Abadan, 1936. 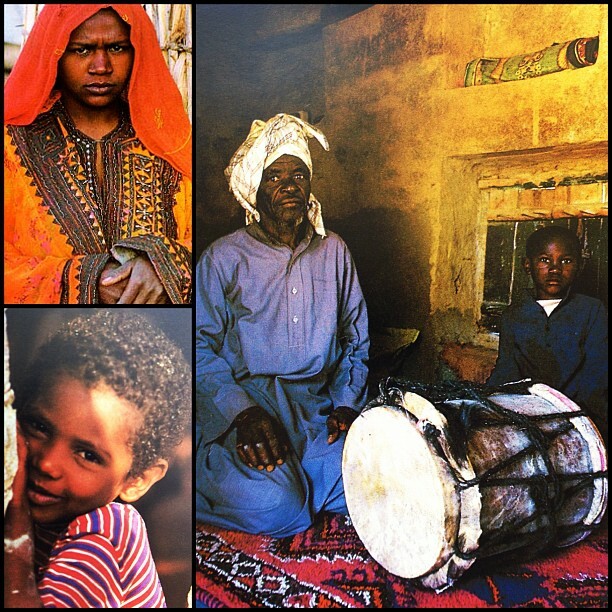 Depending on where they settled, however, Afro-Iranians have assimilated with varying degrees of success. For example, Afro-Iranian communities in the Sistan-Baluchestan province function separately from the rest of society and perpetuate a rigid caste system within their community that offers little opportunities for social mobility. The highest social class in the community are the Durzadehs, Africans who came to Iran for maritime work. The name Durzadeh comes from “dor” meaning pearl, a nod to their occupations in the Persian Gulf. Because of their notable status, the Durzadehs regard themselves as higher than the Ghulams and Nukars, who came to Iran as slaves. The caste system is so rigid that the marriage between the Durzadehs and the Ghulams or Nukars is strictly forbidden. In Bandar Abbas, however, the Afro-Iranian communities have assimilated to a much larger degree, and interracial marriages are not uncommon. Religiously, most Afro-Iranians identify with Shi’ism, a symbol of their assimilation into greater Iranian society, but folk traditions and mystic beliefs permeate their communities as well. In Behnaz Mirzai’s documentary Afro-Iranian Lives, she interviewed different members of the Afro-Iranian community in Qeshm, an island in the Persian Gulf, to better understand the practice of zar, a belief that people can be possessed by up to seventy-two different kinds of winds. The belief in zar can also be found amongst indigenous populations in Egypt, Sudan, and Ethiopia. Related to zar is gowati, the belief that dancing has healing properties. Bandari music and dancing have its roots in gowati, which has been largely eclipsed by the shiny costumes and Los Angeles Iranian music industry. Despite the popularity of bandari music, however, the depiction of Afro-Iranians in popular media is fairly scant. The most famous portrayal of an Afro-Iranian is Bahram Beizai’s 1989 film Bashu: the Little Stranger. The film follows the story of a boy who is orphaned by the Iran-Iraq war and escapes war-torn Khuzestan for safety. Bashu finds himself in the entirely foreign Mazandaran province in Northern Iran, where his adoptive mother buys extra bars of soap to wash his skin clean from its darkness, children bully him for his complexion, and villagers call him a bad omen. Baizai addresses racism and ignorance directly, taboo topics in mainstream Iranian culture. The neglect of Afro-Iranians by most Iranians stems from a number of factors, most of which stem from the Aryan myth. The Aryan myth effectively whitewashed Iran’s history, leading many to believe that true Iranians are only light-skinned and that Iran never engaged in slavery. Beyond this, the lack of Afro-Iranian presence in media further reinforces any preconceived notions that exist about Africans in Iran: that they simply do not exist. Regardless of the reasons for the neglect, it is important to acknowledge the presence and history of the Afro-Iranian communities, not only for their sake, but with the intention of better confronting racist narratives, like the Aryan myth, that exclude so much of Iran’s population. Perhaps if, as Iranians, we educate ourselves, fewer Afro-Iranians will be perceived as foreigners or as “less Iranian” than the rest of us.